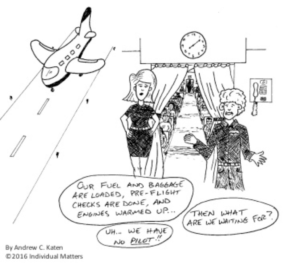 If a child were an airplane, executive functions (EFs) would be the pilot. While many parts and processes of a plane may be in good working order, only the pilot can set a destination, take off, steer the plane where it needs to go, address any issues along the way, and land safely. Without a skilled pilot, the plane is nothing more than a complex assembly of hi-tech parts and equipment sitting idly in a hangar. Similarly, our brains are powerful and complex mechanisms. But without efficient EFs, individuals may find it difficult to achieve even the simplest goals. From fixing a lunch, to cleaning a room, to learning math, to organizing a school project… EFs are needed to set and reach objectives of all dimensions. Without strong EF skills, a child is essentially a plane without a pilot. Though the term EF is often described as a singular brain function, it is in fact comprised of multiple, interconnected, complex skills and abilities—so much so that even the experts cannot not agree on a single EF model. The key to any successful intervention is to correctly identify the specific area of struggle. Dr. Brown’s model provides a framework for identifying and understanding which area(s) of EF your child might be struggling with so that intervention may be tailored accordingly. ©2016 Katrina Katen. All rights reserved. Permission is granted to share this article with others, as well as to print or post it on other websites, so long as credit is given to the author.